Where journalists rock out. On stage. With bands. With one evening’s worth of parties done, it’s time to look ahead to tonight’s list. 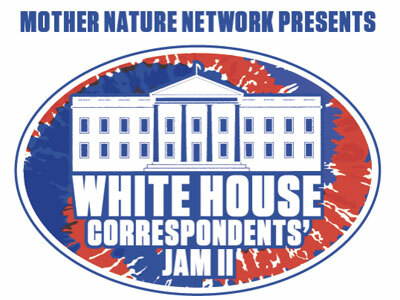 If you feel like ditching the cocktail attire, Mother Nature Network’s White House Correspondents’ Jam II is one party you can come to suited in denim, if that’s what you’re feeling. And instead of merely mingling among the partygoers, the featured names listed on the invite, both established rockers and working journalists, will be taking to the stage and performing for the crowd. There will be Phil and the Busters, a mashup band, in that its members all hail from other bands: Rolling Stone’s Chuck Leavell, R.E.M.’s Mike Mills, Widespread Panic’s John Bell and Marshall Tucker Band’s Paul Riddle. If bands fronted by New Yorker editor David Remnick are more your thing, he’ll be there, playing there with band The Sequoias. Other journo bands include CNBC senior economics reporter Steve Liesman and The Mooncussers, Fortune senior editor at large Brian Dumaine and The Prowlers, and New York Times chief Washington correspondent Carl Hulse and The Native Makers. NBC News national correspondent Erica Hill will be the night’s emcee. It starts tonight at 7:00 p.m. ET at The Hamilton Live. Invite only, it goes without saying.